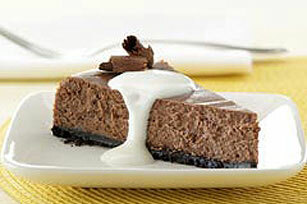 Use crushed chocolate wafer cookies for the crust of this creamy Chocolate Cheesecake. You'll love the double-chocolate goodness of Chocolate Cheesecake. Preheat oven to 325°F if using silver 9-inch springform pan (or to 300°F if using a dark nonstick 9-inch springform pan). Mix wafer crumbs and margarine until well blended. Press firmly onto bottom of pan; set aside. Beat cream cheese in large bowl with electric mixer on medium speed until well blended. Add 1/2 cup of the sour cream, the granulated sugar, cocoa powder, flour and vanilla; beat until well blended. Add eggs, one at a time, beating on low speed after each addition just until blended. Pour over crust. Bake 50 to 55 min. or until center is almost set. Run knife or spatula around rim of pan to loosen cake; cool before removing rim of pan. Refrigerate at least 4 hours or overnight. Mix remaining 3/4 cup sour cream and the powdered sugar. Serve spooned over cheesecake. Store leftover cheesecake in refrigerator. One serving of this rich chocolatey cheesecake is a great way to help celebrate a special occasion. Garnish with chocolate curls just before serving.